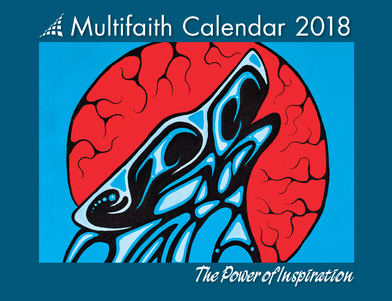 We are thrilled to announce that the 2018 Multifaith Calendar, The Power of Inspiration, is now available! Now in its 32nd year of publication, the Multifaith Calendar combines comprehensive information relating to world religions, their spiritual traditions and observances with beautiful, community-sourced artwork to create a unique and compelling product with outstanding educational and artistic value. Nearly 500 different holidays and religious festivals from 14 world religions, as well as select cultural, public and United Nations observances, are detailed in the Calendar. By helping to raise awareness of these observances, as well as their historical origins and the spiritual precepts associated with them, the Multifaith Calendar helps to facilitate cross-cultural understanding, provide a basis for dialogue, discussion and community involvement / engagement, and foster environments of mutual respect, awareness and understanding across communities and in workplaces and public institutions throughout North America. Visit the Multifaith Calendar website to find out how you can get your Multifaith Calendar today!